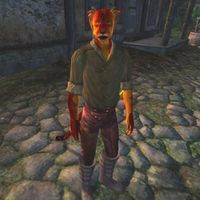 J'riska is a Khajiit commoner who lives in the village of Border Watch. Similar to his fellow townsfolk, J'riska is a superstitious soul who believes that "the three signs of K'sharra" will mean the end of the world. Until that happens, he tries not to worry too much about it and lives a relaxed existence; He gets out of bed every morning at 4am, and immediately steps outside to talk to all his neighbors and wander around town. He does that the entire day until bedtime at 10pm, the only break being a two hour dinner at the Border Watch Inn at 7pm. The exception to this routine happens during the related quest, where the prophecy becomes reality and he will run around town in wild panic. He will continue to do so until the quest is completed, and then return to his usual life, now just a bit more scared than before. His wardrobe is a typical lower-class affair: A collared shirt, a pair of huntsman moccasins, and laced leather pants. He carries a leveled blunt weapon and two leveled pieces of randomly chosen light armor, which he equips along with his weapon during the last stages of the related quest. Afterwards, he will be wearing all the armor, even when he sleeps, just to be on the safe side. J'riska also carries a small amount of gold. He is a Khajiit of few words, but will point you towards the town shaman Ri'Bassa, when he learns that you know about the K'sharra prophecy. Esta página foi modificada pela última vez à(s) 03h09min de 26 de abril de 2013.